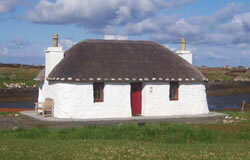 The thatched cottage is situated in a lovely area of the north end of South Uist and is in a quiet and peaceful location, ideal for a very relaxing holiday. There are fantastic views over the South Ford and to the hills on South Uist. The cottage consists of a small cosy sitting room/kitchen, a shower room and one double bedroom. The kitchen houses a washing machine, fridge, electric hob and oven. The sitting room houses a flatscreen Freeview TV, CD player, iPod docking station and a space saver table. The bathroom has an electric shower. All island attractions and facilities are easily reached by car from here. Located close by is a well stocked food shop, jewellers/cafe and there is also a restaurant that serves fantastic meals. Within a few miles on the neighbouring island of Benbecula there are other shops and attractions and also a Community School which houses a games hall, swimming pool, fitness suite, cafe and a well stocked library. You can enjoy lovely leisurely walks and cycles from the cottage. This is an ideal location to take day trips to the neighbouring islands of Eriskay, Barra, Berneray and even to Harris and Lewis. Please note: While the property is located in Rhugashinish, access is via the Ardmore road.